We’re pleased to announce that we’ve stumbled upon a box containing copies of Masonna’s Frequency L.S.D.. The record has long been out of print, so the release makes a welcomed reappearance in our catalogue. 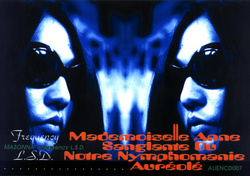 Released in 1998, Frequency L.S.D. is highlighted by tripped out tonal works intertwined within its overall chaos, giving it a much different feel than previous efforts. This recording features 14 ear wrenching tracks and is beautifully packaged in a limited edition special packaging (5 1/4" by 7 1/4").